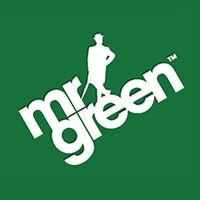 Microgaming’s Superspy Slot Is Back in the Form of Agent Jane Blonde Returns! 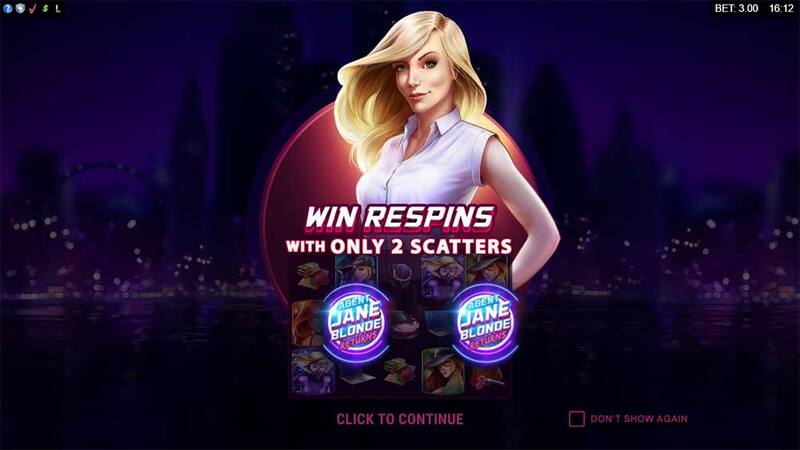 32Red Casino has just added the latest Microgaming slot Agent Jane Blonde Returns to their casino, this time developed by Stormcraft Studios. 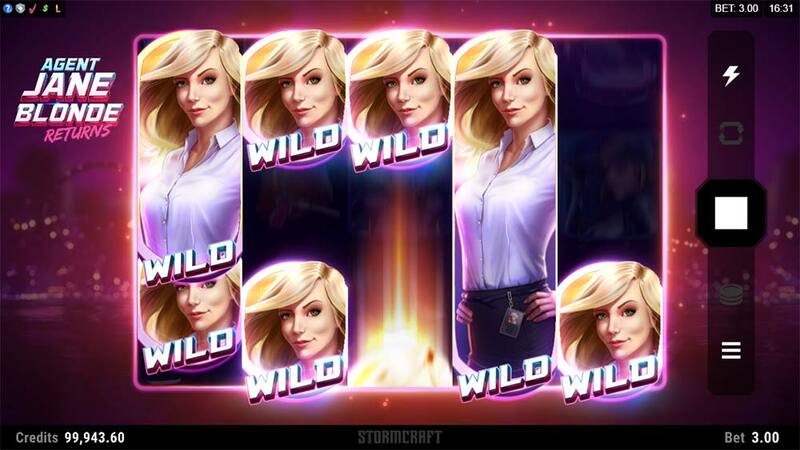 The original slot Agent Jane Blonde was originally released way back in 2005 in what was a super high volatile slot that was very popular for many years mainly due to the volatility, free spins with multipliers and potential huge wins from the 5 of a kind premium symbols. 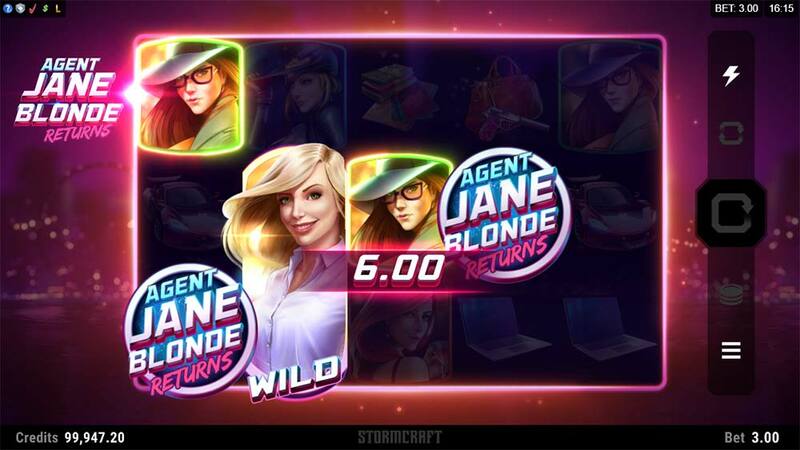 Quite a lot has changed since 2005 in terms of slot design and what players expect, and in Agent Jane Blonde Returns the visuals have certainly been brought up to date with some clean cartoonish graphics, animations and decent voiceover sound effects. 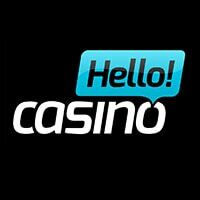 The reels are still a standard 5×3 layout with 15 fixed paylines but the main focus of this slot has been drastically changed, with complete removal of the free spins bonus round and accompanying multipliers. Replacing these features are a plethora of wilds, which can be singular or fully stacked to cover an entire reel and an initially interesting 2 Scatter feature. When 2 Scatters or more land on the reels the Respin feature activates, transforming the scatters into wilds and locking them in place on the reels, if more wilds land on the reels during the re-spin this feature keep repeating. 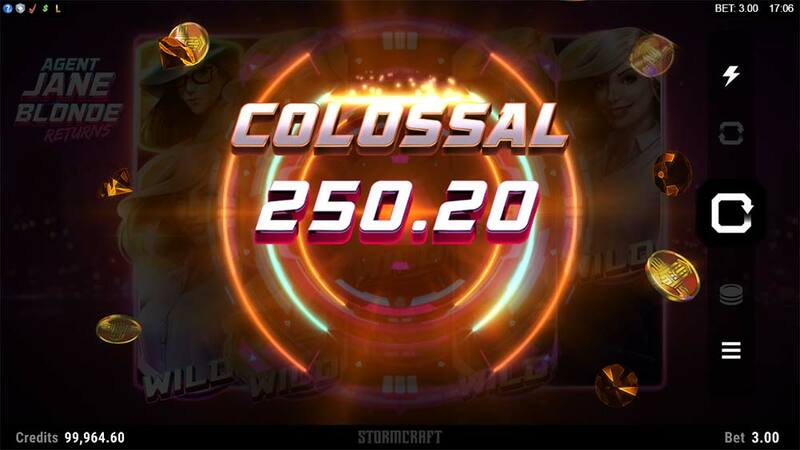 The re-spin feature is, in reality, the main bonus and where you are most likely to score the bigger wins, with several wilds landing during the respins it’s quite possible to score several wild line wins although the paytable is nowhere close to as volatile as its predecessor was. Treating this slot as a standalone release we maybe wouldn’t be as critical, but for a slot that is a sequel to what was a popular and big hitting slot this just feels like a low variance churner when the initial concept should have been – make it as volatile as the original but make the features even better – and that clearly hasn’t been done here. Wilds – These come in a variety of sizes from single wilds up to symbols large enough to cover an entire reel. Scatter Re-Spins – When 2 or more scatter symbols land in view they are transformed into wild symbols and held on the reels, a re-spin then occurs and any additional wilds that land in view are held on the reels and the process repeats until no new wilds appear. 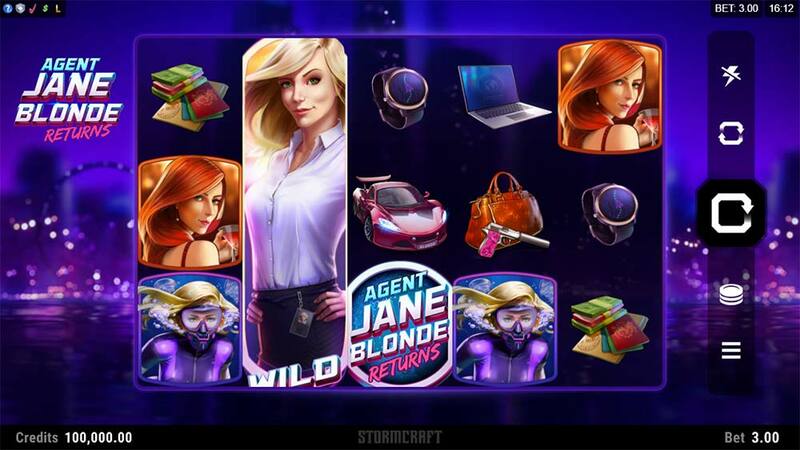 Overall the Agent Jane Blonde Returns slot is a disappointing release from Microgaming, this is largely due to it being a sequel that was a big hitting slot in its time. 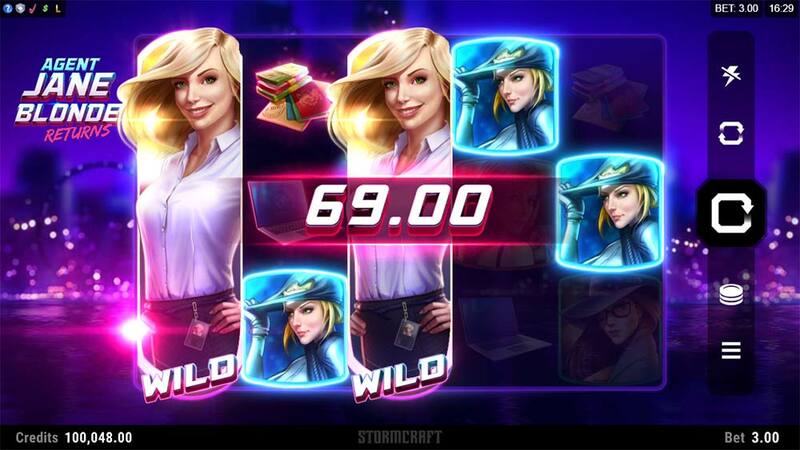 Whilst the graphics, animations and sound effects are all satisfactory the gameplay and most importantly lack of a main bonus round and multipliers means the latest Agent Jane slot is a totally different type of slot to the original (and not in a good way!). In our playtests we struggled to get close to a 100x stake win even with plenty of wilds held on the screen, it really does seem that this slot has been designed with a lowish variance. If the original slot was as popular as something like Immortal Romance players would be in an uproar with an offering like this pitched as a sequel!